I have tried other brands of heated baths and the type where you use the regular bath and then put in the "element". 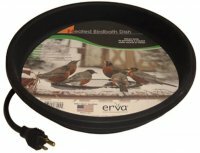 Nothing compares to the quality of Erva, especially for the heated bird bath.The one I have now is going on 10 years(I think, or pretty close)and will hopefully work this winter. If it won't, then I know exactly where I will buy the next one. Right here and this replacement dish specifically, which is what I have now.